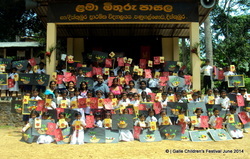 On Thursday 26th June 2014 students from Dikkumbura Primary School enjoyed a day of creative workshops and performances! 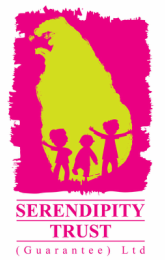 This Galle Children's Festival Outreach Event enabled the Serendipity Trust to bring the Festival to children who would not normally get to participate due to their remote location. Workshops included 3D Gift Cards, Matchstick Creations and Paper Crafts. Students from the school participated in a range of traditional songs and dances. They even took part in a whole school rendition of the Hokey Pokey!! This event was generously supported by Dikkumbura Primary's partner school in the United Kingdom, Kings College School, Cambridge. Special thanks to the staff and parents from Dikkumbura Primary who all worked together to ensure the day went smoothly. We'd also like to convey our thanks to the Sulakshi, Chaturika and Wasana, our talented workshop facilitators who all volunteered their time to offer this unique opportunity to the students. Contact us to express your interest in supporting our outreach program!